The prime purpose of collecting your data is to improve your listening experience. Whether we're collaborating with music services to make sure you have access to your favourite playlists and can discover new artists, or giving you the ability to start off the music with your voice or the touch of your smart home system, or offering highly responsive customer support when something goes wrong, our aim is for you to listen as effortlessly as possible. This Privacy Statement (the 'Statement') explains the personal information we collect from you, either directly or indirectly, and how we will use it. Personal information is any information that can be used to identify you or that we can link to you. The Statement also elaborates on the choices you can make about the data we collect, and how you can control these decisions. It applies to all products offered by Sonos ('Sonos Product(s)'), including our Sonos control app ('Sonos app' or 'app'). It also applies to any Sonos-controlled websites, as well as other offline interactions, such as visiting a Sonos store or attending a Sonos event (collectively referred to as, 'Services'). Please read this Statement carefully to understand how Sonos may collect, use and share your personal information. The terms 'we', 'us', or 'Sonos' are each intended as reference to Sonos, Inc.
We collect information you voluntarily provide to us, such as your name, phone number and email address; for instance, when you want to learn more about Sonos Products and Services or when you contact our Customer Care group for assistance with your Sonos Products. We automatically collect information about you, such as Functional Data (as defined below) and Additional Usage Data (as defined below) about your use of your Sonos Product or information collected by using cookies and similar technologies when you use, access, or interact with us via our websites or app. We may, for example, collect information about the type of device you use to access our websites, the operating system and version, your IP address, your general geographic location as indicated by your IP address, your browser type, the webpages you view on our websites, and whether and how you interact with content available on our websites. We may receive information about you from other sources, including third parties, such as music service partners and partners with whom we offer co-branded services or engage in joint-marketing activities. We may also receive information about you from social media platforms, for instance, when you interact with us on those platforms. We protect data obtained from third parties according to the practices described in this Statement and we also apply any additional restrictions imposed by the source of data. Sonos does not target and is not intended to attract children under the age of sixteen. Although visitors of all ages may navigate through our websites or use our app, we do not knowingly collect or request personal information from those under the age of sixteen without parental consent. If, following a notification from a parent, guardian or discovery by other means, a child under sixteen has been improperly registered on our site by using false information, we will cancel the child's account and delete the child's personal information from our records. As you gather more information about Sonos, you may virtually or physically visit a site that we own. Examples include browsing our website, calling our in-house sales representatives, physically visiting a Sonos-owned store or attending Sonos-sponsored events. To learn more about Sonos Products, you may voluntarily provide personal information, such as your name and email address during these interactions. We may also collect information about you online via cookies or similar technologies when you visit our websites. Why: We use this information to share news about events and products offered by Sonos. Additionally, the IP address helps us to understand geographic information about our website visitors better, so that we can improve our website for everyone. It is our legitimate interest to process your personal data for these purposes. Once you have decided to buy a Sonos Product, we offer a way for customers to buy directly from us at www.sonos.com or at a Sonos retail store. When you buy from us, you may be asked to provide information so that we can complete your purchase. Why: We use this information to complete your transaction, carry out any follow up with you about your purchase, help with any delivery issues, handle returns, and other issues related to the purchase of Sonos Products. Processing your personal data for this purpose is necessary for the performance of the agreement we have with you. Please note, we do not store any payment or credit card information. We only use payment information in connection with the purchase of Sonos Products. Once you receive your Sonos Products, you will be required to connect your Product to a network at home. Each Sonos Product needs to be connected to the internet for set-up. As part of the initial set-up, you will be asked to download the Sonos control app either from our website or a third-party website, such as the Chrome Web Store. The Sonos app allows you to control your Sonos system from the device of your choice (for example your phone or tablet). During the set-up process, the Sonos app will ask you to set up an account and register your system with Sonos. You must register your Sonos Products, in order for them to work. As part of registering your Sonos Product, the app will prompt you to enter information such as an email address and location data (country, postcode). It is required to provide this information to register your Sonos system. Your Sonos system will then establish a unique alpha-numeric identification number which we use to help identify your specific Sonos system in a less personal manner. This identification number will be associated with the email address that you provide along with the Product serial number and the IP address from where the Product connected. As part of registration, you will need to set up a Sonos account. We collect your password to your Sonos account which is only used for authentication and Sonos account access. We collect: your name, phone number, email address, location data, your password, and IP address. Please note, your password is stored using one-way hash, which means that it cannot be recovered (or disclosed) by anyone, including Sonos. Why: We collect this information to help get your Sonos Product working securely (which helps prevent unauthorised access to your Sonos Products or home network) and to make sure that we enable you to select the right music service options based on your geographic location (e.g. radio stations available in your country). This processing is necessary for the performance of the contract we have with you. We also use your email to send you Sonos-related notifications, such as promotional messages, software updates, information about Sonos Products and/or Services, and to share exciting Sonos news and Product offerings. It is our legitimate interest to process your personal data for these purposes. There are three main reasons we collect information from your Sonos Products: (1) to offer you music services or other audio content choices (e.g. tv or games) which is necessary for the performance of the agreement we have with you, (2) to offer you control over your Sonos system which is necessary for the performance of the agreement we have with you, and (3) to make your Sonos Products better over time which is our legitimate interest. Using Sonos Products involves selecting audio content to play in the rooms of your choice. Although you can play free internet radio or music files stored locally on your home network (for example on your computer’s hard drive), most Sonos owners prefer to add a streaming music service for playback via their Sonos Products. Examples include Spotify, Apple Music, and other audio content services. The addition of any of these music services requires you to link your individual music service to your Sonos system. Once you have started playing music or other audio content on your Sonos Products, the data we receive is dependent on your preferences. This data is absolutely necessary for your Sonos Product to perform its basic functions in a secure way and you will not be able to opt out from this data collection, sharing and/or processing if you want to continue to use your Sonos Products. Registration data. This data includes your email address, location, language preference, Product serial number, IP address, and Sonos account login information (as described above). System data. This data includes things like Product type, controller device type, controller operating system, software version, content source (audio line in), signal input (e.g. whether your TV outputs a specific audio signal such as Dolby to your Sonos system), information about WiFi antennas, audio settings (such as equalisation or stereo pair), Product orientation, names of the music service(s) you added/enabled on your Sonos product, the names you have given your Sonos Product in different rooms, whether your Product has been tuned using Sonos Trueplay technology, and error information. Why we collect Functional Data: We collect this information to help ensure that your Products are working properly, to provide you with customer support, to honour your audio preferences, and to guide product improvement and customer support decisions. We also collect this information to guide product improvement and customer support decisions which is our legitimate interest. 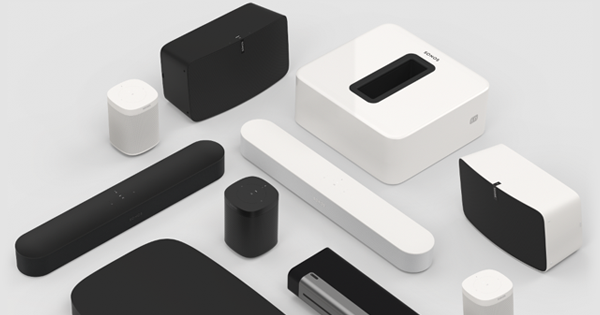 In order to improve your experience with Sonos Products and to offer better, personalised Sonos Products and Services that meet the needs and expectations of our customers, we collect the following Additional Usage Data. The processing of this information is in our legitimate interest as further set out below (under Why). You can opt out of sharing this data by following the steps listed here. Performance Information. This includes things like the temperature of your Product, WiFi information like signal strength, how often you use music services you have connected to your Sonos system (including, for some services, your login username, but not password), information about how often you use the Sonos app versus other control mechanisms, flow of interactions within the Sonos app, how often you use the physical controls on the unit and location data when the Sonos app is in use, flow of interactions within the Sonos app, and duration of Sonos Product use. Activity Information. This includes duration of music service use, Product or room grouping information, command information (such as play, pause, change volume, or skip tracks), information about playlist or station container data including listening history (‘Recently Played’); and Sonos playlist or Sonos favourites information; each correlated to individual Sonos Products and your interactions with them. If you enable voice control, we will additionally collect information about track data. Why: We collect this information so that we can help ensure Sonos Products are functioning properly, provide a personalised experience for our customers, determine what types of Product or feature improvements would please our customers most, and to help predict potential problems with Sonos Products. Collecting this data is our legitimate interest to support a user-friendly experience that meets your needs and help you with issues you may experience. It is your choice if you want us to collect this information, and therefore you can opt out of sharing this data by following the steps listed here. Note that personalisation services (e.g. Recently Played), Voice Control, and Direct Control functionality cannot be used if you opt out of this data collection, as these functionalities require this Additional Usage Data to operate. You can always clear all Recently Played by following the instructions in the Sonos app. As the world and our homes become more connected, we realise that our customers may prefer to control their Sonos Products by means other than their Sonos app, for example, by using a voice enabled product (like Amazon Alexa), through a home control mechanism (e.g. a Lutron Pico remote), or through the app offered by their favourite music service. To enable this function, you will be prompted to allow such devices to connect with your Sonos system (similar to the process you go through to connect a music service). Once this function is enabled, we collect and process the Functional Data, the Additional Usage Data, and Audio Data. Sonos will share a subset of this data with partners that provide the services you have requested. Sharing your relevant data with these partners and further processing of such data is necessary for the performance of the contracts with these partners for your benefit, in order to ensure that the voice or direct control function is working properly. If you wish to object to any such processing, simply disable the feature (for example, disable voice control) or unlink the feature (for example, unlink your home automation remote) from your Sonos Products. However, the voice control function or other direct control functionality will not work unless you authorise us to collect and process the data as outlined in this section. Why: This information is needed to fulfil the agreement we have with you, to ensure proper functionality and to help improve these features, which is also our legitimate interest. Sonos is not continuously capturing sound in your home. There are two occasions when we will capture sound from within your home: (1) when you enable voice control technology on the voice-enabled Sonos Product (such as Sonos One or Beam); and (2) when you utilise our innovative Trueplay room-tuning technology. Voice control. Voice control works by your voice enabled Sonos Product 'listening' for a key wake-up word. Please note, not all Sonos Products are voice enabled, and if your Sonos Product is voice enabled, you will have to actively enable your Sonos Product to start 'listening.' In further detail, this 'listening' means that voice-enabled Sonos Products buffer and re-record locally, without transmitting or storing any information, until they detect the word or phrase (such as “Alexa”) that triggers the device to begin actively recording. If the Product does not detect the wake-up word, it continues to record over itself in a never ending loop lasting a few seconds. This is all done locally on your Product and is not sent to Sonos or any third party. If a wake-up word is detected, the Sonos Product begins recording. In other words, it does not record or retain any audio data, or begin to transmit any data until it is 'woken up.' You are notified that it is recording by a visual element, such as a light on the Sonos Product, and a specific sound. The Product will record until your voice command is finished. The actual recording of your voice command is then sent to the voice partner you have authorised to receive such recording (for example, Amazon). Concurrent with the voice recording, your Product will collect data (for example, decibel level at each frequency) about the ambient noise in the room. It is not possible to extract any speech from this type of data. We collect this data to help us improve our speech recognition technology which is our legitimate interest. If you are trying to state a voice command whilst music is playing for example, Sonos may improve the technology by lowering the music so that your voice command can be understood properly. Trueplay room tuning. Innovative Trueplay analyses acoustic factors that can impact sound quality in the room where your Sonos Product is placed. You will have to actively enable Trueplay. The purpose of the Trueplay analysis is to alter your Sonos Products in a manner that enhances the sound. To do this, a user goes through an interactive process (watch the video here) that gathers certain data about your room (for example, the number of speakers and speaker placement), including information about background noise levels (for example, decibel level at each frequency). This information is used to help make sure that the tuning gives you the best outcome possible. For example, if your dog barks during the Trueplay testing, the Product knows to ignore the background noise of a barking dog during the testing. The collection of this data is necessary for the fulfilment of the agreement we have with you if you activate Trueplay. From time to time, you may decide to contact our Customer Care group for assistance with your Sonos Products. To be able to offer you the best service possible, we may collect certain data from you or your Sonos Products. We collect: This may include contact information, such as your name, email address, phone number, social media identifiers (if you contact us using a social media channel), and the content of your chats and other communications with Sonos Customer Care (including, in some cases, voice recording if you call Customer Care). In certain situations, it is useful for the Customer Care team to have a 'Diagnostic' of your Sonos system. This is essentially a technical system snapshot of all relevant information leading up to the incident and includes information such as the music service being used, volume level, Product configuration, WiFi signal and router information, error codes, device information (e.g. the operating system, and version of the Sonos app being used). Collecting the above described information is necessary to provide customer support. You will be informed in advance before we make a snapshot. We do not capture snapshots without telling you first. If you are a Beta tester, we take a daily diagnostic of your Sonos system automatically (per the terms of the Beta tester agreement). Why: We collect this information to give you the best and most efficient customer support possible. For instance, for customer inquiries and technical questions, we use contact information to respond to the customer in their preferred channel (phone, email, social). For technical problems, we use system diagnostic data to effectively troubleshoot the issue. For product returns and/or exchanges, we use contact information to ensure successful product receipt and/or delivery. Using these types of data is necessary to fulfil the agreement we have with you. Sonos uses the data we collect to provide you with the Products and Services we offer, which includes using data to improve and personalise your experiences. We also use the data to communicate with you, for example, informing you about your account, new products or services available, security and other types of updates. We use data to provide, operate, support and improve the Sonos Products and Services we offer to ensure our customers can listen as effortlessly as possible. This processing is necessary for the performance of the agreement we have with you. We use data to respond to customer enquiries, diagnose Product problems, repair customers' Sonos Products and provide other customer care and support services. This processing is necessary for the performance of the agreement we have with you, as well as to serve our legitimate interest. We continually use data for research purposes and to develop and improve our Sonos Products and Services, including maintaining and improving the performance of our Sonos Products and Services, developing and adding new features or capabilities, such as using error reports to improve security features, using search queries and clicks to improve the relevance of search results and using usage data to determine what new features to prioritise. This processing is necessary to serve our legitimate interest. We use data to protect the security and safety of our Sonos Products and our customers, to detect and prevent fraud, to resolve disputes and enforce our agreements. This processing is necessary to serve our legitimate interest. We use the data we collect to deliver and personalise our communications with you. For example, we may contact you by email or other means of electronic communication (including through the Sonos app) to inform you about new Sonos Products or Services, new music services available in your area, security or software updates, update you on a support issue, invite you to take part in a survey. This processing is necessary to serve our legitimate interest. For more information on this, please visit The Legal Bases for Using Personal Information. Sonos does not and will not sell personal information about our customers. We only disclose your data as authorised in this Statement. We may share information with the following types of third parties. Sonos uses a variety of third-party vendors to carry out services like websites management and hosting, cloud-related services, online Product purchases and delivery, credit card processing, and email communications. We only share your personal data as necessary, such as to complete a transaction or to provide a Product or Service you have requested or authorised, and only with vendors or agents working on our behalf for the purposes described in this Statement. In this case, your personal information will be shared with these agents or contractors but only for the purpose of performing services on behalf of Sonos and in accordance with this Statement. It is our legitimate interest to share information with these parties for these purposes. For questions about third-party vendors, please send an email to privacy@sonos.com. To ensure the best customer experience and that music services function properly, Sonos may share relevant Product Activity Information and your instructions with music services that you have authorised to interact with your Sonos Products. For instance, if you use a music service on your Sonos Products or to control your Sonos Products, we will have to share certain information with that music service to enable you to do this. Sharing data with music services, as instructed by you, is necessary to fulfil the agreement we have with you. Once you have enabled direct control of your Sonos system, we may share relevant Product Activity Information with control partners that you have authorised to interact with your Sonos Products. Sharing data with control partners, as instructed by you, is necessary to fulfil the agreement we have with you. Once you have activated speech recognition, we may share relevant Product Activity Information and Audio Data with voice control partners that you have authorised to receive such data, in order to control your Sonos system. Sharing data with control partners, as instructed by you, is necessary to fulfil the agreement we have with you. We share information with Sonos-controlled affiliates and subsidiaries for business purposes, such as internal administration, promoting Sonos Products, and providing customers with our Sonos Products and Services. It is our legitimate interest to share information with these parties for these purposes. When legally required, strictly necessary for the performance of the services or to protect our rights, or the rights of our affiliates or users, we disclose your personal information to law enforcement authorities, investigative organisations, our affiliates, or in legal proceedings. We will share your personal information when we believe in good faith that it is necessary for us to do so in order to comply with a legal obligation under applicable law or to respond to a valid legal process (e.g. a search warrant, a court order, or a subpoena). Please note, our Products include links to Products or applications of third parties whose privacy practices may differ from Sonos. If you provide personal data to any of those third parties or their products, your data is governed by their privacy statements, and we encourage you to read these privacy statements carefully. When sharing data with third parties, your personal information may be transferred to countries where data protection laws may provide a lower standard of protection for your personal information than your country. We take great care in protecting your personal information and have put in place adequate mechanisms to protect it when it is transferred internationally. We will transfer your personal information in compliance with applicable data protection laws and will implement suitable safeguards to ensure that your personal information is adequately secured by any third party that will access your information (for instance, by using the Standard Contractual Clauses as approved by the European Commission). If you have questions or wish to obtain more information about the international transfer of your personal information or the implemented safeguards, please send us an email to privacy@sonos.com. The use of your personal information may be necessary to perform the agreement you have with us. For example, to complete your purchase of your Sonos Product, to register and maintain your account, to help with delivery issues, to handle returns, to register your Sonos system, and to make sure that your Sonos Product performs its basic functions in a secure way, or to respond to your requests. Where legally required, we may rely on your consent to use your personal information. When this is the case, we provide you with more specific information when we actually request your consent. You may withdraw your consent at any time by sending us an email to privacy@sonos.com. Your withdrawal will not affect the lawfulness of processing based on your consent before your withdrawal. We may use your relevant personal information to ensure compliance with applicable laws; for example, to comply with lawful requests from law enforcement, and for regulatory investigations and compliance. We may use your personal information for our legitimate interests. For example, we rely on our legitimate interest to analyse and improve our Sonos Products and Services and the content on our websites and app, to send you notifications about software updates or information about Sonos Products and Services, and to use your relevant personal data for administrative purposes and for fraud detection and prevention. Furthermore, except where consent is required under applicable local law, we rely on our legitimate interest to send you relevant marketing communications. When using personal data to serve our legitimate interests, we will always balance your rights and interests in the protection of your personal data against our rights and interests. Where we process your personal information based on our legitimate interest and no opt-out mechanism is available to you (e.g. in your Sonos Product settings), you may exercise your right to object by sending an email to privacy@sonos.com. Sonos is committed to protecting the security of your personal information. However, whilst we take reasonable precautions to guard the personal information we collect, no security system is impenetrable. We use a variety of appropriate technical and organisational measures and industry standards to protect your personal information and help prevent information about you from loss, theft, misuse, and unauthorised access, disclosure, alteration, and destruction. For example, we store the personal data you provide on computer systems that have limited access and that are in controlled facilities. We also ensure that our third-party data centre vendors provide adequate security measures. Additionally, your data is protected with encryption, such as Transport Layer Security (TLS), during transition over the Internet. Please note, your password is stored using one-way hash, which means that it cannot be recovered (or disclosed) by anyone, including Sonos, it can only be reset. You can only access your Sonos account information and our service through the use of an individual user login and password. To protect the confidentiality of personal information, you must keep your password confidential and not disclose it to any other person. Please notify us immediately if you believe your password has been misused. You should always log out and close your browser when you finish your session. Please note, we will never ask you to disclose your password in an unsolicited phone call or email. If you have any questions about the security of your personal information, you can contact us at privacy@sonos.com. Personal data collected by Sonos may be stored and processed in your region, in the United States (for example, in our major data centres), or in any other country where Sonos or its affiliates, subsidiaries or service providers are located or maintain facilities. Sonos has put in place adequate mechanisms to protect personal information when it is transferred internationally, for example by using the Standard Contractual Clauses as approved by the European Commission. otherwise as necessary to allow us to conduct our business in compliance with applicable laws and regulations. All personal information we retain will be subject to this Privacy Statement and our internal retention guidelines. Sonos will delete your personal data when it is no longer required for the abovementioned purposes. If there is any personal data that, for technical reasons, we are unable to delete entirely from our systems, Sonos will implement appropriate measures to prevent any further processing or use of such data. If you have a question about a specific retention period for certain types of personal information we process about you, please send an email to privacy@sonos.com. We rely on you to ensure that your personal information is complete, accurate, and up to date. Please do inform us promptly of any changes to or inaccuracies of your personal information by contacting privacy@sonos.com. If you wish to access, edit, or remove profile information, change your password, close your account, or request deletion of your personal data, you can do it by logging in to your Sonos account or Sonos app or sending an email to privacy@sonos.com. If you cannot access certain personal information collected by Sonos via the Sonos account, the Sonos app or directly via the Sonos Product that you use, you can always contact us by sending an email to privacy@sonos.com. We will respond to any request to access or delete your personal data as soon as possible but certainly within 30 days. You can always opt out of Additional Usage Data collection by logging in to your Sonos app for iOS or Android. Do it in just a couple of clicks. To opt out please follow the instructions below. You can opt out of receiving direct marketing communications from Sonos by following the instructions included in every email sent to you, via the “Unsubscribe” tab. You can also opt out of email subscriptions or in-app messaging by updating your Profile and Contact Options in your Sonos account. We respect your choice, and we will stop sending you promotional emails once you unsubscribe or change your communication settings. Please note, regardless of your communication settings, we will continue to communicate with you regarding changes to terms and conditions, policy updates, Sonos Product software updates, routine customer service messages such as information about current or past purchase, delivery of products, service interruptions, data breaches, or other significant information about a Product you own, such as discontinuation of support or safety issues. To help more people listen to more music on Sonos, we use several modern marketing tools in support of our advertising efforts. A cookie is a small data file containing a string of characters that is sent to your computer when you visit a website. When you visit the website again, the cookie allows that site to recognise your browser. The length of time a cookie will stay on your computer or mobile device depends on whether it is a "persistent" or "session" cookie. Sonos uses both types of cookies. Session cookies will only stay on your device until you stop browsing. Persistent cookies stay on your computer or mobile device until they expire or are deleted. We use the following types of cookies on our website. Functional cookies. These cookies allow our websites to remember choices you make whilst browsing and personalise your experience. We may store your geographic location in a cookie for instance, to ensure that we show you the website relevant to your area. Third Party cookies. Third party cookies are those placed by websites and/or parties other than Sonos. These cookies may be used on our website to improve our products or services or to help us provide more relevant advertising. These cookies are subject to the respective privacy policies for these external services, for example, Facebook Data Use Policy. More information about cookies we use on our website is included here. In addition to cookies, we sometimes use small graphic images known as 'pixels' (also known as web beacons, clear GIFs, or pixel tags). We use pixels in our email communications to you (if you have selected to receive such communications) to help us to understand whether our email communication has been viewed. We also use third-party pixels (such as those from Google, Facebook, and other advertising networks) to help us provide advertising that is relevant to your interests. Learn more about our advertising and marketing activities below. If you have any questions about the use of your personal information, please send an email to privacy@sonos.com. Unless otherwise stated, Sonos, Inc. is a data controller for personal data we collect through the Sonos Products and Services subject to this Privacy Statement. Our address is 614 Chapala Street, Santa Barbara, CA 93101, USA. Sonos Europe B.V. is our data protection representative for the European Economic Area and Switzerland. The data protection officer of Sonos Europe B.V. can be contacted at the following address: Schuttersweg 10, 1217 PZ Hilversum, The Netherlands, or via email at privacy@sonos.com. Sonos may modify or update this Statement when necessary, to reflect customer feedback and changes in our Sonos Products and Service. Please review it regularly. When we update this Statement, we will revise the 'Last Update' date at the top of the Statement. If there are material changes to the Statement or in how Sonos uses your personal data, we will inform you either by posting a notice of such changes, prior to them taking place, or by directly sending you a notification. We encourage you to regularly review this Statement to learn more about how Sonos is using and protecting your information.